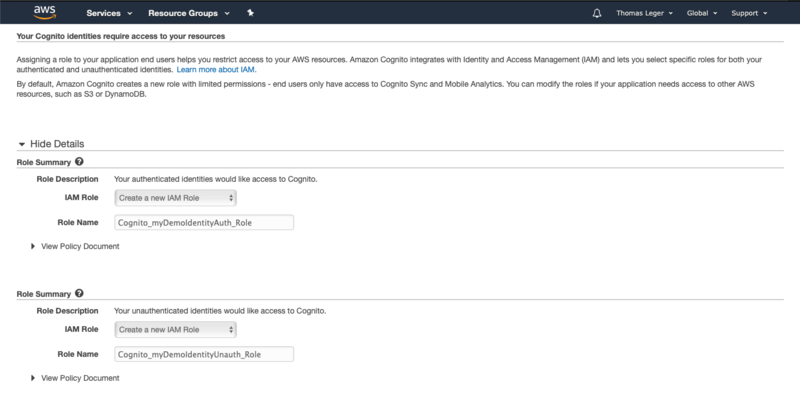 Use Cognito Federated Identities on API Gateway and test your endpoints! You're building a serverless microservice, want to use Cognito Federated Identity as your API Gateway authorizer, but after a few hours scouring the AWS documentation, Google and StackOverflow (nope, wrong Cognito) you still haven't found how to make a simple REST API call to authenticate yourself, be able to build a collection for your webservice and maybe, just maybe, test your endpoints using curl, Postman or Paw? Let's get to work. We'll setup a Cognito Federated Identity with unauthenticated users, an example serverless micro-service to test everything, and finish off by building a Postman / Paw collection to reference all these endpoints. And if you're nice, I'll even tell you how I found the proper endpoint URLs 😉 (hint: debug can't hold his liquor). User or Identity Pools? What's the difference? 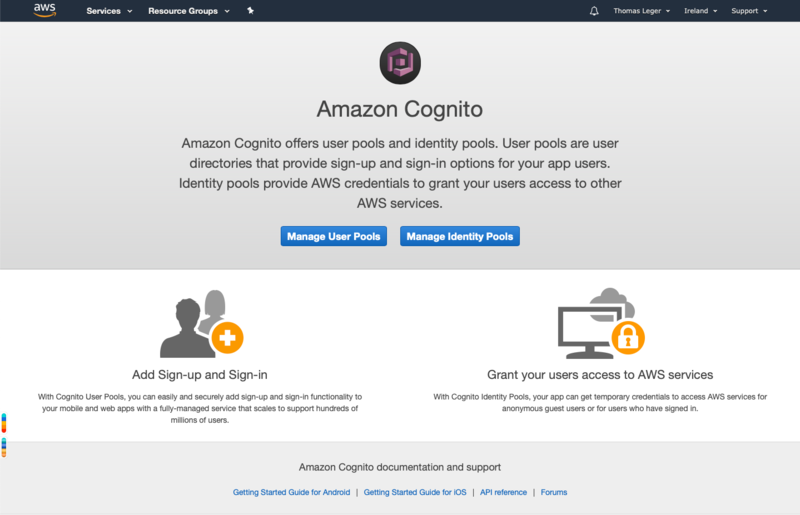 Pick Manage Identity Pools. If you don't already have an Identity Pool it'll open the "Getting started wizard". Pick a an identity pool name, and enable access to unauthenticated identities. Authentication providers don't really matter for this example since we'll only use unauthenticated access. Create the pool! Final step, the permissions! Leave the default parameters. The wizard will create an authenticated and unauthenticated IAM Role for your Identity Pool. Write down the unauth role's name; we'll need it later. Go back to the Federated Identities console. Select your newly created identity pool, and click "Edit". Write down the Identity pool ID that will be displayed below the Identity pool name field. Write that down; we'll need it later. For this part, we'll use the Serverless framework's default aws template. My preference usually goes for typescript on Node.js, but for simplicity's sake I'll just go with the aws-nodejs template. If you haven't setup the Serverless framework before, follow their instructions here. Write down the enpoint's url. If you've setup the framework correctly, that's it. If the deploy did succeed but the output is empty, double check your serverless.yml, including the indentation. It's YAML. Remember the Federated Identity Pool we created earlier? Still have the unauthenticated role's name written down? Ok, head to the AWS console, and access the IAM service's dashboard. Go to Roles, and open the IAM Cognito Unauthenticated role we created earlier (and who's name you wrote down). It'll take you the role's summary. In the wizard, pick "API Gateway" as the Service. Tick the "Read" access level checkbox. Tick the "Specific" radio button. Enter the "Api gateway resource path". What is that you ask? Remember your endpoint's url we wrote down earlier? The resource path is the weird part between https:// and .execute-api.us-east-1.amazonaws.com/dev/hello (in my case, it was w93r25kdl0). All good? Now click "Review policy", then "Save changes", and let's get out of here. I don't know about you, but I just can't stand the AWS console. Now, let's setup your collection! I use Paw, but you can use Postman, Insomnia (which is great for testing GraphQL APIs, such as AWS Amplify's, by the way), or even cURL (yes I did just put a link for more info on cURL). Whatever rocks your boat. Replace the values with yours (here's how to find your AWS Account ID). Now let's get ourselves some credentials! It's pretty much the same request. Replace Run it. And we've got ourselves some credentials! Save the AccesKeyId and the SecretKey from the response's Credentials object, and let's authenticate against our previously deployed endpoint and finally get our sweet canned template reply! So, now is why I prefer to use a more sophisticated client than cURL to test AWS endpoints. IAM secured endpoints (wether it's the one deployed on API Gateway or AWS' "native" endpoints - think AWS Lambda) require requests to be signed. 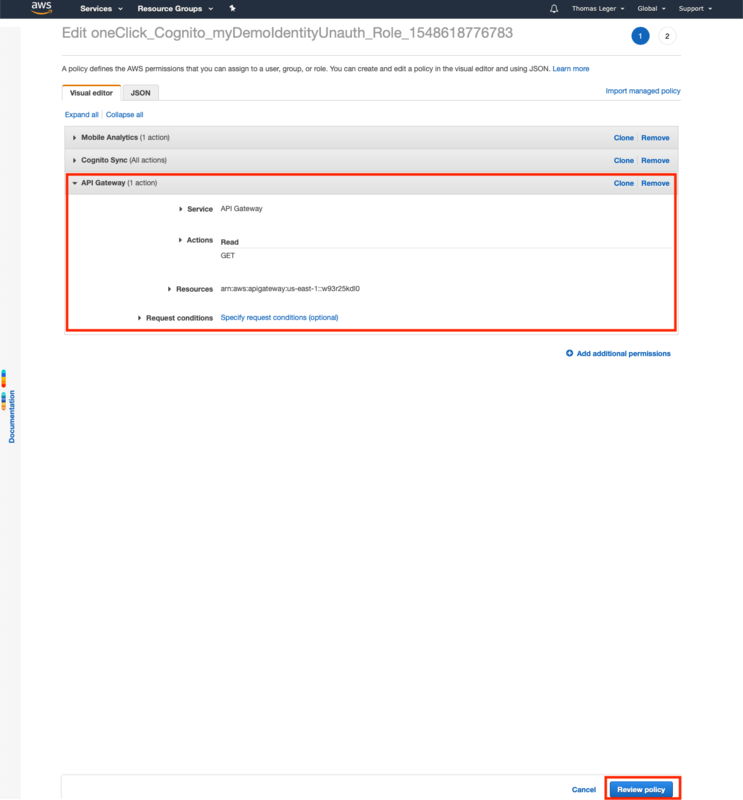 Using AWS Signature v4. Which I'd really rather not do by hand. 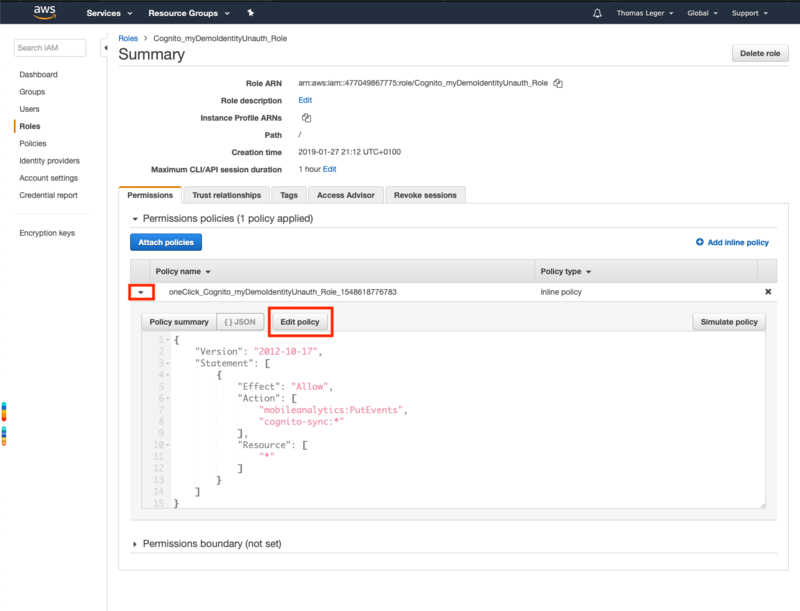 So, using your favorite client (in my case, Paw, which has an extension for that, but in our case the built-in S3 Signature will do), Postman (here's some documentation for that), or whatever suits you best, make a GET request on your previously deployed API's url (https://w93r25kdl0.execute-api.us-east-1.amazonaws.com/dev/hello for me), sign it using your client's AWS Signature setting, extension,... (for Paw, go to Auth, pick "S3 Signature", and fill the Access Key ID and the Secret Access Key ID using the values we got previously, and make your request. You should get a JSON answer, with a message and an input property. That's it! Now you can test your IAM authorized endpoints more easily, especially if your client offers dynamic values. Don't forget to delete all the created resources (IAM Roles, Identity Pool & the Serverless microservice)! I said I'd tell you how I figured out the endpoints URLs, as well as the requests, so here it is. Just install aws-cli, set it up and set up your Federated Identity as we did earlier.The cli tool has commands for many AWS services, including Cognito Federated Identity. 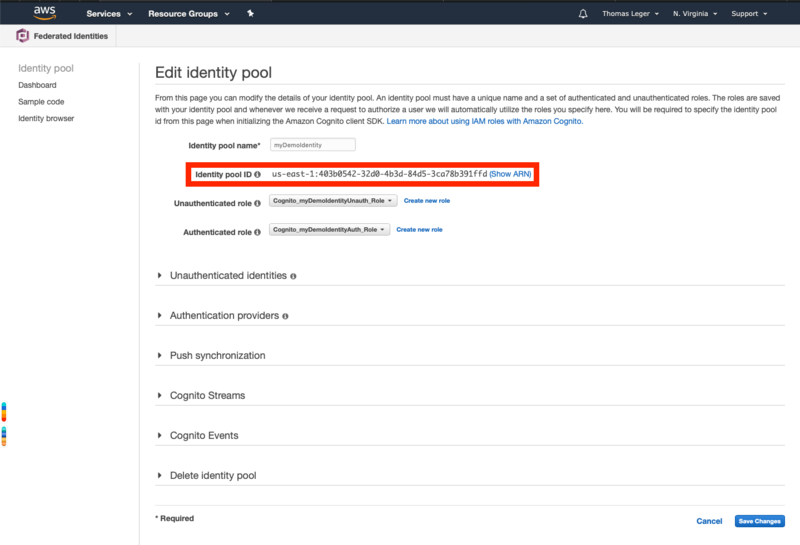 In our case, aws cognito-identity get-id which takes an --identity-pool-id parameter (your identity pool's ID), and aws cognito-identity get-credentials-for-identity, which takes an --identity-id (the value returned from get-id). 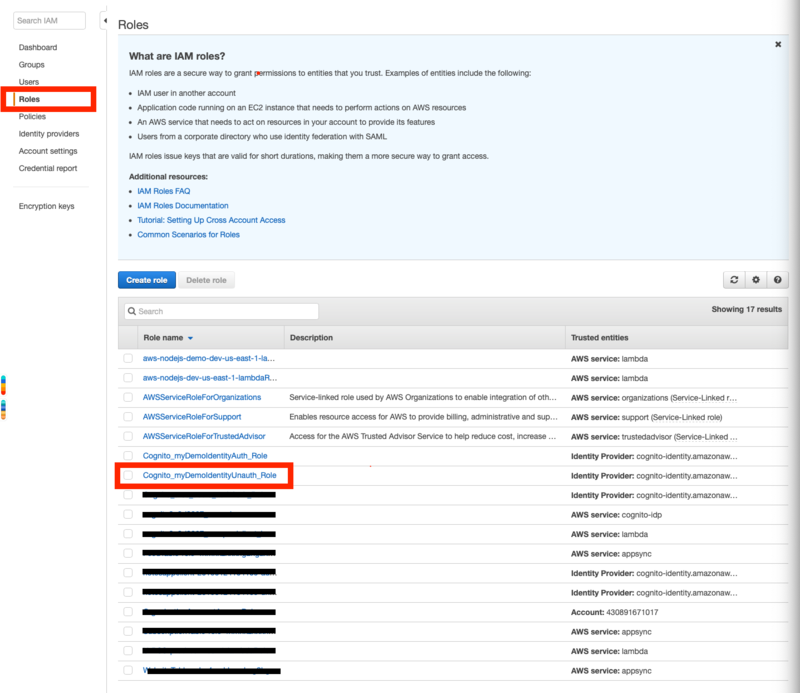 Just run these two with the --debug flag, as well the region & account-id parameters if necessary (ie aws cognito-identity get-id --identity-pool-id us-east-1:403b0542-32d0-4b3d-84d5-3ca78b391ffd --region us-east-1 --account-id yourAccountId --debug), and it'll spill the beans!